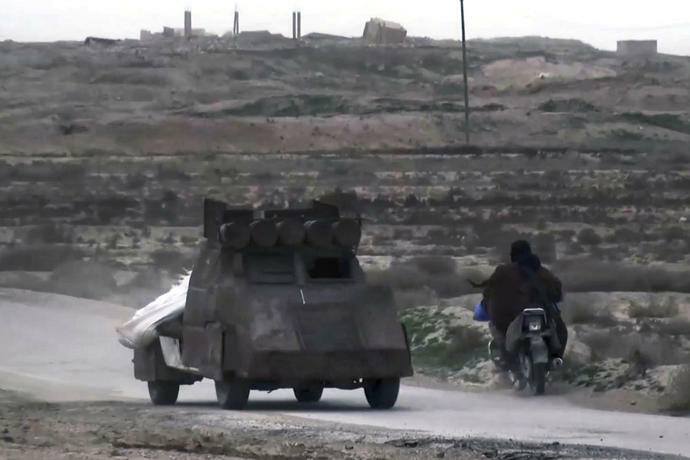 BEIRUT (AP) - The Islamic State gunmen came out of hiding in the middle of the night and set up a checkpoint on a rural road in eastern Syria. For several hours, they stopped those passing and searched through their mobile phones to check their allegiances, until they vanished again into the desert. One young man, an education worker, got through the checkpoint safely. But when he got to his destination in the next village, the threat was waiting for him. An IS loyalist told him: Don't remove pro-IS graffiti from school walls or you will pay the price. 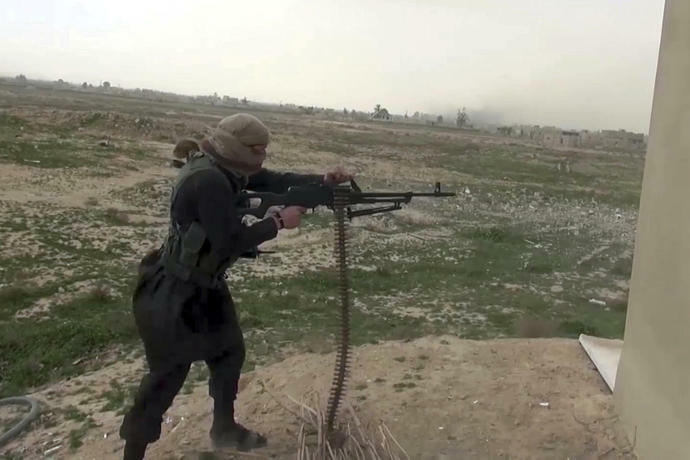 The incident, one of many similar ones in past weeks, sent a bigger message - the Islamic State group may have lost almost all its territory, but it hasn't left. 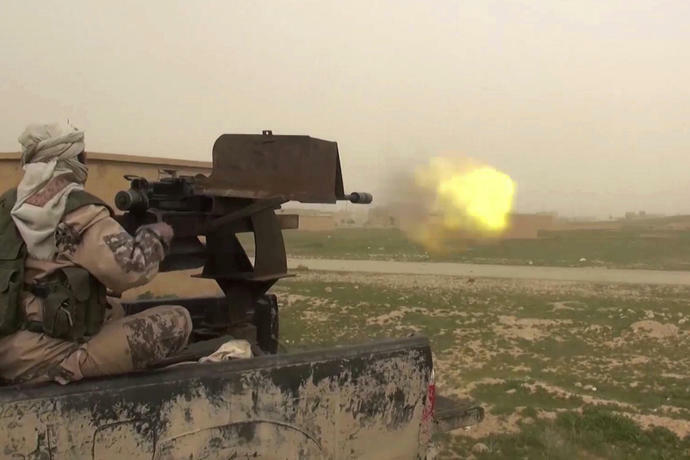 The group's once-sprawling caliphate has been reduced to a remote scrap of land in Syria's eastern desert, where a few hundred battle-hardened fighters are making a final stand against U.S.-backed forces. President Donald Trump has vowed to withdraw American forces from Syria, saying the militants are all but defeated. "As we work with our allies to destroy the remnants of ISIS, it is time to give our brave warriors in Syria a warm welcome home," he said in his State of the Union address Tuesday, referring to the group by another acronym. But his own Defense Department has warned that IS could stage a comeback in Syria within six months to a year if the military and counterterrorism pressure on it is eased. Gen. Joseph Votel, the commander of U.S. forces in the Middle East, told a Senate committee Tuesday that battlefield gains can only be secured by "maintaining a vigilant offensive," saying IS still has "leaders, fighters, facilitators, resources and the profane ideology that fuels their efforts." He estimated there are between 1,000 and 1,500 IS fighters in the small area they still control, but said others have "dispersed" and "gone to ground." The campaign has unfolded across northern and eastern Syria, in areas where the militants were defeated months or even years ago. An IS bombing attack last month killed four U.S. soldiers and contractors in Manbij - a town in northern Syria that was liberated in 2016. Fliers appeared in a village in Syria's oil-rich Deir el-Zour province last summer, warning residents that IS still controlled nearby oil fields and that "anyone found to steal from them... should only blame themselves." Other fliers sparked a mass desertion by local volunteers for the SDF. "It was unclear what would happen to (IS) in the future, but I think the U.S. withdrawal in Syria increased the chances for an IS resurgence by manifold," said Hassan Hassan, an expert on IS who is originally from eastern Syria and is now a senior fellow at the Washington-based Tahrir Institute for Middle East Policy. Syria is less hospitable for IS. The group's brutality and foreign roots alienated many Syrians, and it faces competition from other Sunni insurgent groups, like the al-Qaida-linked Hayat Tahrir al-Sham. But unlike Iraq, Syria has large, ungoverned areas opened up by the civil war. "Syria will remain in part a place where (IS) could retreat and hide because there is still space in Syria," Hassan said. Turkey views the Kurdish forces in the SDF as an extension of the insurgency it is battling at home, and has vowed to launch a military offensive against them. President Bashar Assad, who also has forces in the area, has vowed to bring all of Syria's territory back under state control. An outbreak of fighting would sap forces from the struggle against IS and generate the kind of chaos in which the group thrives. "Imagine what (could) happen if one third of Syria changes hands from one security apparatus to another," Hassan said. He says IS loyalists have infiltrated the Kurdish-run administration, exploiting both local Arab resentment at Kurdish rule and the Kurds' eagerness to recruit Arab allies. He says his group has documented nearly 20 cases in which former IS civil servants have returned to their jobs. 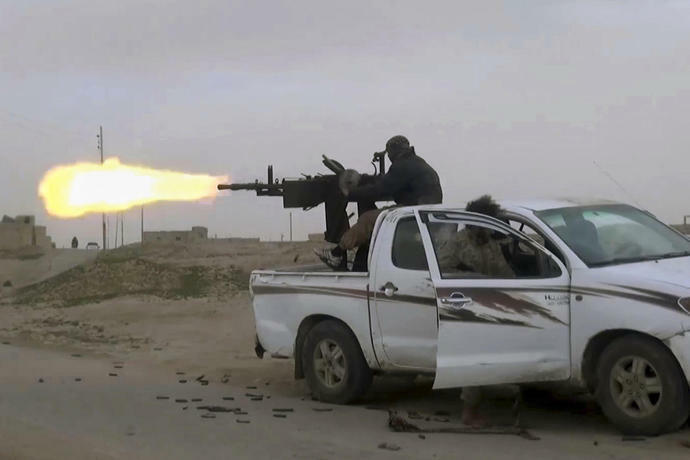 It has also documented a number of recent assassinations by IS, including the killing of an Arab SDF commander and a man who works in money transfers. "Daesh will be there even if they vanish physically," he said, using the Arabic acronym for IS. "There are cells everywhere."